Sherlock Holmes investigates one of the most fiendish cases in all fiction -- The Strange Case of Dr. Jekyll and Mr. Hyde. This is the first edition hardcover. It was also released in paperback. Sn 1886 Robert Louis Stevenson published his chilling tale, The Strange Case of Dr. Jekyll and Mr. Hyde; for a century it has intrigued millions off readers. But only recently a manuscript has materialized that reveals for the first time that the details of Stevenson's classic were purposely incomplete: that his "story" was based on fact–and that the world's most celebrated detective, Sherlock Holmes, was involved in the case. 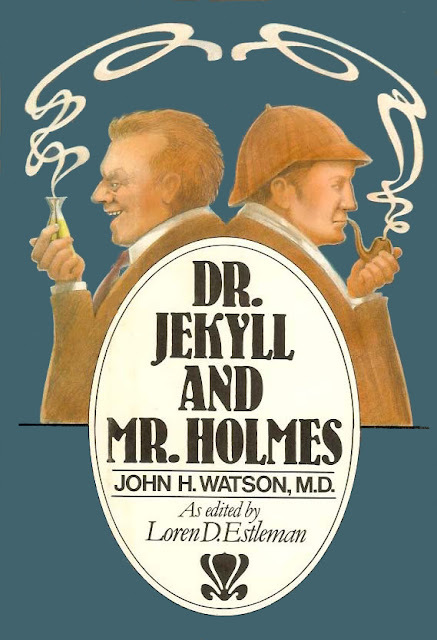 Here is Dr. Watson's chronicle relating the blackest mystery in Holmes's career. . . . The murder of a Member of Parliament has baffled Scotland Yard for months. Mycroft Holmes arrives at his brother's quarters in Baker Street with an urgent plea from the Queen: Holmes must take over the investigation. As Holmes and Watson stalk a diabolical foe through the nether regions of London, they uncover horrors that threaten to destroy forever the very codes that hold together Victorian society. So terrifying were the implications of the Jekyll-Hyde case that it could only be recounted as fiction. Here finally is the entire first-hand account of this heinous crime as recorded by Dr. Watson. And an explanation of the circumstances that demanded that Holmes's involvement in the matter be kept secret. Until now.